Government under German occupation carried on in the name of the absent and non-consenting King Petar II from 29 Aug 1941 - 20 Oct 1944. On 06 April 1941, Yugoslavia was invaded by the Axis powers led by Nazi Germany; by 17 April 1941, the country was fully occupied and was soon carved up by the Axis. Yugoslav resistance was soon established in two forms, the Royal Yugoslav Army and the Yugoslav Partisans. During 1943, the Yugoslav Partisans began attracting serious attention from the Germans. In two major operations of Fall Weiss (January to April 1943) and Fall Schwartz (15 May to 16 June 1943), the Axis attempted to stamp-out the Yugoslav resistance once and for all. The battles, which were soon to be known as the Battle of the Neretva and the Battle of the Sutjeska respectively, saw the 20,000 strong Partisan Main Operational Group engaged by a force of around 150,000 combined Axis troops. On both occasions, despite heavy casualties, the Group succeeded in evading the trap and retreating to safety. In 1941, the Yugoslav dinar was replaced, at par, by a second Serbian dinar for use in the German occupied Serbia. The dinar was pegged to the German reichsmark at a rate of 250 dinars = 1 Reichsmark. This dinar circulated until 1944, when the Yugoslav dinar was reintroduced by the Yugoslav Partisans, replacing the Serbian dinar at a rate of 1 Yugoslav dinar = 20 Serbian dinars. KM# 31 / Schön# 10 1 Dinar. Year: 1942. Weight: 2.97g [3.00g]. Metal: Zinc. Diameter: 20.00 mm. Edge: Plain. Alignment: Coin. Mint: Budapest, Hungary. Obverse: Large numeral "1"at the top and "ДИНАР" (Dinar) below it. Wreath on both side crossing at the bottom and Date above the crossing. "БП" (BP) mint mark below the Date. 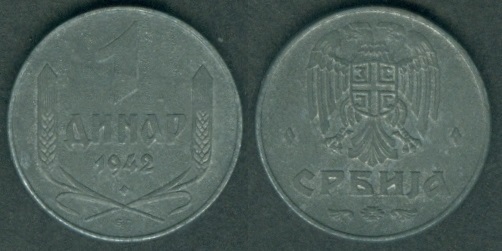 Reverse: Serbia emblem at the top and "СРБИЈА" (Serbia) written below it. Four diamonds on left and four on the right side. Decoration at the bottom. Mintage: 50,000,000. Mintage Years: One year type. Note: KM#30 50 para 1942 zinc, diameter: 18.00 mm with weight: 2.00g. also exists. KM# 32 / Schön# 11 2 Dinars. Year: 1942. Weight: 4.03g [4.00g]. Metal: Zinc. Diameter: 22.00 mm. Edge: Plain. Alignment: Coin. Mint: Budapest, Hungary. 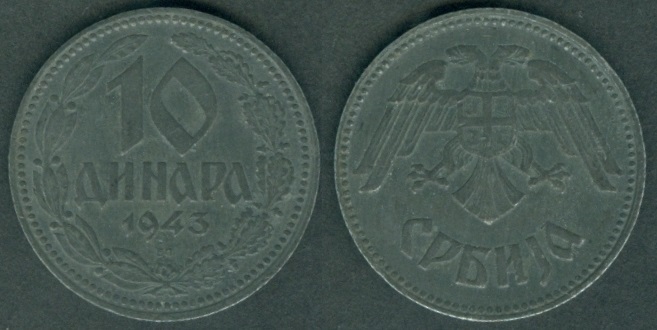 Obverse: Large numeral "2"at the top and "ДИНАРА" (Dinars) below it. Wreath on both side crossing at the bottom and Date above the crossing. "БП" (BP) mint mark below the Date. 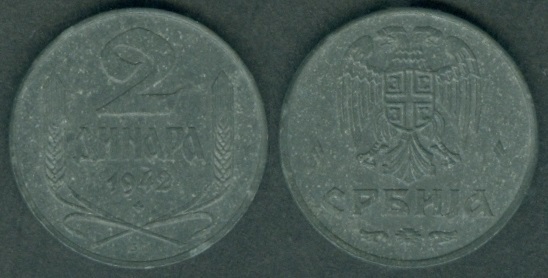 Reverse: Serbia emblem at the top and "СРБИЈА" (Serbia) written below it. Four diamonds on left and four on the right side. Decoration at the bottom. Mintage: 40,000,000. Mintage Years: One year type. Same as above coin, but "СРБИЈА" (Serbia) written on the Reverse side is more thicker. KM# 33 / Schön# 12 5 Dinars. Year: 1943. Weight: 6.07g [6.00g]. Metal: Zinc. Diameter: 26.50 mm. Edge: Reeded. Alignment: Coin. Mint: Budapest, Hungary. Obverse: Large numeral "10"at the top and "ДИНАРА" (Dinars) below it. Wreath all around in circular form and Date above the wreath knot at the bottom. "БП" (BP) mint mark below the Date. 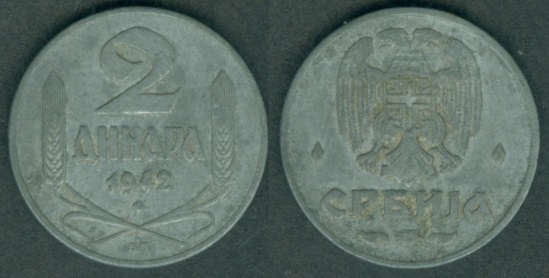 Reverse: Serbia emblem with open eagle wings at the top and "СРБИЈА" (Serbia) written below it. Mintage: 50,000,000. Mintage Years: One year type.